Mast cell tumors are the most common skin tumors in dogs. Mast cell tumor is a cancer of a particular type blood cell normally involved in the body’s allergic or inflammatory responses. Mast cell tumors most commonly affect the skin, but can also affect other organs such as the spleen, liver, digestive system, and bone marrow. Boston terriers, boxers, bulldogs, and pugs are more likely to develop mast cell tumors than other breeds. The exact cause of mast cell tumors is unknown. Dr. Marc Smith recommends either one, or a combination of the following options, to treat mast cell tumors in dogs. Treatment varies depending on the dog’s individual needs. Oral Neoplasene – Oral Neoplasene is a liquid herbal veterinary medicine extracted from the bloodroot plant that is used to treat cancer in dogs. Neoplasene dosing is based on body weight and usually given prior to feeding twice daily. 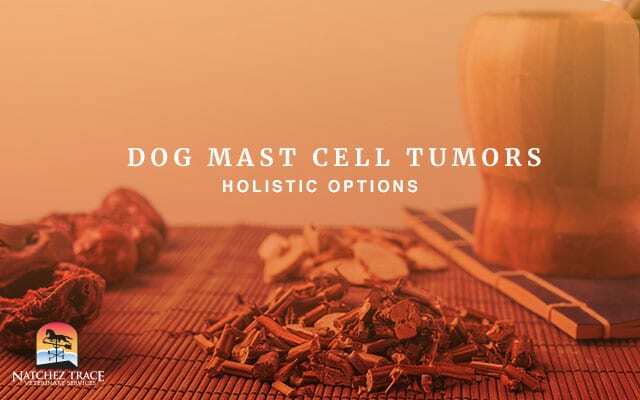 Max’s Formula – Max’s Formula is a Traditional Chinese Veterinary Medicine (TCVM) herbal blend that treats tumors and lumps in dogs, cats, and horses. Max’s Formula is a blend of eight different herbs specifically chosen to address the root causes of lumps and tumors. The blend is available in bulk powder, capsules, and teapills. Max’s Formula is dosed according to weight and given with food twice daily. Stasis Breaker – Stasis Breaker is a TCVM herbal blend that treats neoplasia, nodules, and tumors in dogs, cats and horses. Stasis Breaker is a blend of six different herbs specifically chosen to address the root causes of neoplasia and nodules. This herbal blend is available in bulk powder, capsules, and teapills. Stasis Breaker is dosed according to weight and given with food twice daily. Continued indefinitely, treatment with these products successfully slows and/or halts the progression of mast cell tumors for many of our patients.